6 For unto us a child is born, unto us a son is given:(JESUS 1ST COMING) and the government shall be upon his shoulder:(JESUS 2ND COMING AS RULING KING FROM JERUSALEM FOREVER AT THE END OF THE 7 YEAR TRIBULATION) and his name shall be called Wonderful, Counsellor, The mighty God, The everlasting Father, The Prince of Peace. BRUSSELS - Just one EU country - the Czech Republic - voted against Palestine's bid to become a UN "observer state" on Thursday (29 November).Fourteen others - Austria, Belgium, Cyprus, Denmark, Finland, France, Greece, Ireland, Italy, Luxembourg, Malta, Portugal, Spain and Sweden - voted in favour. The rest, including Germany, until now a firm ally of Israel, abstained.The result highlighted the EU's lack of unity on the conflict.But it also marked a drain in sympathy for Israel in Europe.Compared to a similar vote on Palestine's bid to join the UN's cultural agency, Unesco, 12 months ago, nine EU countries which abstained or voted No on Unesco changed their votes to Yes or abstained on the UN observer state decision.Overall, Palestine won Thursday's vote by 138 to nine with 41 abstentions.The other No votes came from Israel itself, Canada, the US and five minor countries - the Marshall Islands, Micronesia, Nauru, Palau and Panama.The UN resolution fixes Palestine's borders on 1967 lines and says that Jerusalem is its capital in the face of Israeli settlement building beyond the 1967 borders and its competing claim to the holy city.It also gives Palestine the right to file cases against Israel in the International Criminal Court (ICC) and the International Court of Justice in The Hague.The vote came after ferocious speeches by Palestinian President Mahmoud Abbas and Israel's UN ambassador Ron Prosor.Abbas called the UN text "the birth certificate for the reality which is the state of Palestine. "He dubbed Israel an "apartheid system of colonial occupation" and he accused it of "racism ... ethnic cleansing ... war crimes ... barbarity ... murder." 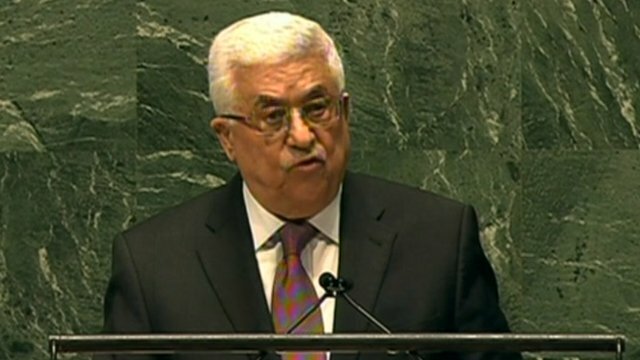 Prosor called Abbas' UN bid a "march of folly. "Noting that his resolution did not recognise Israel as a Jewish state or guarantee its security, he said it "is so one-sided, it doesn't advance peace, it pushes it backwards." The office of Israeli PM Benjamin Netanyahu later tweeted on Abbas that "someone who wants peace does not talk in such a manner" and threatened to "act accordingly. "Meanwhile, several EU ambassadors took the floor in the UN chamber.France described its Yes vote as "a choice of enlightenment and consistency." Germany urged Israel and Palestine to resume peace talks and warned Palestine not to use its new ICC weapon - positions echoed by most EU speakers.It said it liked Abbas' resolution because it called for a two-state solution, which "implicitly recognises Israel's right to exist. "German officials earlier this week told Israeli media they declined to vote No in protest at Israeli settlement expansion.There was a discrepancy between Italy and the UK.The Italian ambassador said he voted Yes because Palestine promised Italy it would not use the ICC. The UK said it did not vote Yes because Palestine refused to make the promise. Finland noted that: "Palestine now has institutions which pass the threshold of what constitutes a modern state. "Turkey and the US also spoke out.Turkish foreign minister Ahmet Davutoglu recalled his visit to Gaza amid the recent fighting. He said he met a man who had lost his child and who wept on his shoulder, portraying him as a symbol of Palestine.America's UN ambassador Susan Rice said: "Today's grand pronouncements will soon fade and the Palestinian people will wake up tomorrow and find that little has changed in their daily lives save for the prospects for a durable peace have receded." But Netanyahu misses the point when he implies that all countries that voted against his recommendation did so because they don’t recognize Israel’s right to exist. This is true for large parts of the Arab world, of course, but the West merely wants to see Israel living in peace next to a Palestinian state, and many countries don’t understand why it’s taking so long.By defying Israel and the US, the Western capitals that agreed to “accord to Palestine Non-member Observer State status in the United Nations,” expressed their frustration with the lack of progress in resolving the Israeli-Palestinian conflict. They no longer find it justified to be paying lip service to a two-state solution but then voting against a Palestinian state, just because Israel and the US are asking them to do so.The Europeans are not stupid. They are painfully aware that the Palestinians’ status upgrade will change very little on the ground, at least not immediately.“Only a political solution to the conflict can bring lasting security, peace and prosperity to Palestinians and Israelis,” European Union foreign policy chief Catherine Ashton said Thursday. The foreign ministers in Paris, London, Berlin and elsewhere likewise said that nonmember state status for Palestine does not end the conflict. But by delivering a collective slap in the face, they hope to get the powers-that-be in Jerusalem to understand that they expect serious moves toward a peace agreement — or else.British Foreign Secretary William Hague, for example, said he asked the Palestinians not to go ahead with the statehood bid as it is “divisive” and could endanger the future of the peace process. In explaining why the UK wouldn’t vote against the resolution, however, he said Wednesday that London was also “very critical” of Israel, especially for continued settlement construction and for failing to make a “generous enough offer to the Palestinians.”Britain’s envoy to the UN made plain that Britain would have voted for the resolution, had it won assurances from Abbas that he would resume peace talks immediately and not seek to exploit the entry of “Palestine” to UN forums to harm Israel. But no such assurances were forthcoming.The question of who’s at fault for the impasse in peace talks — so important to Israel — played a minor role in many nations’ decision to vote yes. They were sending a wake-up call to Jerusalem that time is running out for a two-state solution.Israel may argue that Abbas failed to respond to former prime minister Ehud Olmert’s 2008 offer to relinquish the entire West Bank — with one-for-one land swaps to enable Israel to retain major settlements — divide Jerusalem and even relinquish sovereignty in the Old City to international trusteeship. Israel may point out that it dismantled the entire settlement enterprise in Gaza and pulled out in 2005. Israel may assert that Abbas is not serious about peace, refuses to negotiate without preconditions, formally still insists on a “right of return” that would flood Israel with millions of Palestinians, and says nice things to Israelis in English but terrible things about Israel to his people and the Arab world in Arabic — notably including at the UN on Thursday.Much of the international community registers some or all of this. But Israel, particularly under Netanyahu, is perceived to be the stronger party, the party with the responsibility to make a greater effort, and the party whose ongoing commitment to the settlement enterprise is gradually taking the ground away from under a Palestinian state. Israeli officials are surely troubled by the nearly universal show of hands in favor of Palestine, yet they downplayed the Palestinians’ upgraded status. It is merely symbolic and nothing is going to change on the ground, they reiterated in the last few days (in stark contrast to several months during which Israel vigorously campaigned against the Abbas plan, threatening to cancel all previously made agreements). Foreign Minister Avigdor Liberman, who is currently in New York but decided not to attend the vote, believes that the step is actually bad for both sides. Despite the celebrations in Ramallah after the vote was announced, the Palestinians “will end up being the greatest losers on the ground,” he said. “This process only enhances the dispute and pushes both sides further apart.”One thing seems certain: the day after Thursday’s vote, the settlements will still be there, Israeli security forces will continue operating as just as they did before, Hamas will still be running Gaza, and Abbas — partner or not — will still be in charge of the PA in the West Bank. The conflict will still be there, but something will have changed.Until now, there was no such thing as “Palestine,” at least not for Israelis. People spoke about the Palestinian Authority, or the Palestinian territories, but rarely uttered the word “Palestine.”Many in Israel will continue to refuse to refer to the West Bank and Gaza as Palestine, but Thursday’s vote made it clear that in the eyes of nearly the entire world, the state of Palestine is on the map, whether Israel likes it or not. In the wake of the UN vote on “Palestine,” Israel must declare sovereignty over its communities in Judea and Samaria (Shomron), Samaria regional council head Gershon Mesika said Friday in an urgent appeal to Prime Minister Binyamin Netanyahu.The PA appeal to the UN was clearly “a media ploy, and an event that was in its entirety a pathetic attempt to copy Jewish history – from the selection of the date of voting, November 29, to the calls of ‘The nation of Palestine lives’ at the ‘spontaneous’ celebrations in Ramallah,” Mesika said.However, he continued, “We must remember that this move is likely to have a growing impact, by upgrading its status to a member state.”“But most importantly, this is the ‘Palestinian’ Authority’s final, decisive killing of the Oslo Accords,” Mesika declared. The PA appeal to the UN violated “both the spirit of the Accords and the first principle in them, that each step would be the result of negotiations.”“Over the years the state of Israel has been the only one keeping the accords, while the Arab terrorist entity, imported from Tunisia, has regularly ignored it. But the appeal to the UN means the declaration of the accords’ death… Therefore the state of Israel has nothing to stop it from annexing all the communities it has established in Judea and Samaria, and the state lands,” he argued.“Not only would it be the only useful response,” he added, “but first and foremost, it would be the morally and historically right thing to do. Judea and Samaria are the heart of the Jewish people.”Declaring sovereignty “would turn today from a fake, copycat holiday of the terrorist PA to a real holiday for the Jews,” he concluded. BRUSSELS - MEPs are demanding a say in deciding the chairman and members of a new bank supervisory board as part of their terms for supporting the EU's banking union.Following a vote of the European Parliament's powerful economic and monetary affairs committee on Thursday (29 November), MEPs adopted a position giving them a veto over the nominee for vice-chairman, alongside a right of investigation for the parliament.The legislation would set up the Frankfurt-based European Central Bank (ECB) as the supervisor of the EU's 6,000-company-strong banking sector and revise the role of the European Banking Authority (EBA), one of the three financial sector supervision bodies set up in 2010.The committee proposal is to give the EBA more powers to carry out stress tests and investigations. It would also move the EBA from London to Frankfurt in a bid to avoid institutional overlap. It is believed that the UK would be prepared to give up the EBA in exchange for the Frankfurt-based Insurance and Occupational Pensions Authority being re-located to London.Under the report by Belgian centre-right MEP Marianne Thyssen, the ECB supervisory board would be required to report to national parliaments. MEPs also backed strict separation of the ECB's monetary policy and supervision arms.Thyssen described the legislation as "an essential first step towards a so-called banking union. "She added that giving the EU's bailout fund, the European Stability Mechanism, the right to directly capitalise ailing banks, would "put an end to the vicious circle between banks in financial trouble and governments with budgetary difficulties. "German Green deputy Sven Giegold, who drafted Parliament's position on the EBA file, said that the committee text would "provide a sound basis for EU banking supervision and responds to the urgent need to address the fragmentation in the European banking system. "With parliament hoping to adopt the package during the December Strasbourg session in two weeks, negotiations between Thyssen and Giegold and ministers will open immediately.But ministers themselves still need to agree on a joint position, with Germany stalling under the motto "quality before speed." An attempt by the Cypriot EU presidency to reach an agreement will be made on Tuesday during a finance ministers' meeting in Brussels.Meanwhile, Socialist and Democrat group spokesperson Elisa Ferreira said that MEPs wanted to see the banking union in place as soon as possible. "We will not give EU finance ministers any excuse for delaying the approval of the supervision system mechanism. This should be completed by the end of this year," she said.At the European Council summit in October, EU leaders agreed that the legal framework for the supervision regime would be concluded by the end of 2012, with the implementation programme starting in 2013.However, there remain tensions between member states about the scope of the ECB's role, with Germany particularly sceptical. In October, Jens Weidmann, the governor of the German Bundesbank, warned that new supervisory powers for the ECB would create a conflict of interest for the bank.The status of the 10 countries outside the eurozone could also be a bone of contention. MEPs were divided but a majority decided that 'opt-in' countries would be able to sit on the ECB's supervisory board but not on the decision-making governing board.The parliament has equal legislative power with ministers on the EBA file but only consultative status for the legislation to beef up the role of the ECB.The ECB directive requires unanimous support in Council.But MEPs are anxious not to be sidelined in negotiations and are determined to treat the two files equally, citing the negotiations in 2011 on the economic governance 'six pack' as a precedent where parliament had enjoyed de facto co-decision even though two of the files were consultative. Dow +7 points at 4 minutes of trading today. Dow -30 points at low today. Dow +30 points at high today so far. GOLD opens at $1,724.70.OIL opens at $88.30 today. Dow -30 points at low today so far. Dow +30 points at high today. I BELIEVE THE LAKE OF FIRE IS A BLACK HOLE. A supermassive black hole emitting a record setting X-ray jet some 12.4 billion light years from Earth has been discovered by NASA. This is the most distant X-ray jet ever observed by NASA's Chandra X-ray Observatory and gives astronomers a glimpse into the explosive activity associated with the growth of supermassive black holes in the early universe.The jet was produced by a quasar named GB 1428+4217.Giant black holes at the centers of galaxies can pull in matter at a rapid rate producing the quasar phenomenon, the observatory said in a statement.The energy released as particles fall toward the black hole generates intense radiation and powerful beams of high-energy particles that blast away from the black hole at nearly the speed of light. These particle beams can interact with magnetic fields or ambient photons to produce jets of radiation. "We're excited about this result not just because it's a record holder, but because very few X-ray jets are known in the early universe," said Teddy Cheung of the National Academy of Sciences.As the electrons in the jet fly away from the quasar, they move through a sea of background photons left behind after the Big Bang.When a fast-moving electron collides with one of these so-called cosmic microwave background photons, it can boost the photon's energy into the X-ray band. "Since the brightness of the jet in X-rays depends, among other things, on how fast the electrons are moving away from the black hole, discoveries like the jet in GB 1428 tell us something about the environment around supermassive black holes and their host galaxies not that long after the Big Bang," said co-author Lukasz Stawarz from the Japan Aerospace Exploration Agency, in Kanagawa, Japan.Because the quasar is seen when the universe is at an age of about 1.3 billion years, less than 10 per cent of its current value, the cosmic background radiation is a thousand times more intense than it is now.This makes the jet much brighter, and compensates in part for the dimming due to distance.Prior to the discovery of the jet in GB 1428, the most distant X-ray jet known was 12.2 billion light years away, and another is located at about 12 billion light years. PALESTINIANS RECOGNIZED BY THE U.N BUT LOSE IN THE END WHEN JERUSALEM IS DIVIDED. Afghanistan, Algeria, Angola, Antigua and Barbuda, Argentina, Armenia, Austria, Azerbaijan, Bahrain, Bangledesh, Belarus, Belgium, Belize, Benin, Bhutan, Bolivia, Botswana, Brazil, Brunei Darussalam, Burkina Faso, Burundi, Cambodia, Cape Verde, Central African Republic, Chad, Chile, China, Comoros, Congo, Costa Rica, Cote D'Lvoire, Cuba, Cyprus, DPR of Korea, Denmark, Djibouti, Dominica, Dominican Republic, Ecuador, Egypt, El Salvador, Eritrea, Ethiopia, Finland, France, Gabon, Gambia, Georgia, Ghana, Greece, Grenada, Guinea, Guinea Bissau, Guyana, Honduras, Iceland, India, Indonesia, Iran, Iraq, Ireland, Italy, Jamaica, Japan, Jordan, Kazakhstan, Kenya, Kuwait, Kyrgyzstan, Lao, Lebanon, Lesotho, Libya, Liechtenstein, Luxembourg, Malaysia, Maldives, Mali, Malta, Mauritania, Mauritius, Mexico, Morocco, Mozambique, Myanmar, Namibia, Nepal, New Zealand, Nicaragua, Niger, Nigeria, Norway, Oman, Pakistan, Peru, Philippines, Portugal, Qatar, Russia, St Kitts and Nevis, Saint Lucia, St Vincent and the Grenadines, Sao Tome and Principe, Saudi Arabia, Senegal, Serbia, Seychelles, Sierra Leone, Solomon Islands, Somalia, South Africa, South Sudan, Spain, Sri Lanka, Sudan, Suriname, Swaziland, Sweden, Switzerland, Syria, Tajikistan, Thailand, Timer-Leste, Trinidad and Tobago, Tunisia, Turkey, Turkmenistan, Uganda, United Arab Emirates, Tanzania, Uruguay, Uzbekistan, Venezuela, Viet Nam, Yemen, Zambia, Zimbabwe. Absent: Equatorial Guinea, Kiribati, Liberia, Madagascar, and Ukraine. President Mahmoud Abbas: "The international community now stands before the last chance to save the two state solution"
The UN General Assembly has voted to grant the Palestinians non-member observer state status - a move opposed by Israel and the US.Palestinian President Mahmoud Abbas told the assembly the vote was the "last chance to save the two-state solution" with Israel.Israel's ambassador to the UN, Ron Prosor, said the bid "doesn't advance peace - it pushes it backwards".The assembly voted 138-9 in favour, with 41 nations abstaining. 'Birth certificate'"Sixty-five years ago on this day, the United Nations General Assembly adopted resolution 181, which partitioned the land of historic Palestine into two states and became the birth certificate for Israel," Mr Abbas told the assembly. "The General Assembly is called upon today to issue a birth certificate of the reality of the State of Palestine," he said.Mr Prosor said "the only way to reach peace is through agreements" between the parties, not at the UN. "No decision by the UN can break the 4,000-year-old bond between the people of Israel and the land of Israel," he said.Opponents of the bid say a Palestinian state should emerge only out of bilateral negotiations, as set out in the 1993 Oslo peace accords under which the Palestinian Authority was established.Speaking after the vote, the US ambassador to the UN, Susan Rice, urged the Palestinians and Israel to resume direct peace talks and warned against unilateral actions.US Secretary of State Hillary Clinton called the vote "unfortunate and counter-productive", saying it put more obstacles on the path to peace.Symbolic milestone-The Palestinians are seeking UN recognition of a Palestinian state in the West Bank, Gaza and East Jerusalem, the lands Israel captured in 1967. France, Spain and Norway are among those urging the General Assembly to raise the Palestinians' UN status. Germany was set to abstain.While the move is seen as a symbolic milestone in Palestinian ambitions for statehood, the "Yes" vote will also have a practical diplomatic effect, says the BBC's Barbara Plett, at the UN.It would allow the Palestinians to participate in debates at the UN and improve their chances of joining UN agencies and bodies like the International Criminal Court.Last year, Mr Abbas asked the UN Security Council to admit the Palestinians as a member state, but that was opposed by the US. OK SO THE BIBLE SAYS ONCE A SCRIPTURE IS DONE 2 OR 3 TIMES IN THE BIBLE IT WILL COME TO PASS.FOR SURE.WELL THERES 2 SCRIPTURES THAT SAY JERUSALEM WILL BE DIVIDED AND THE ENEMIES OF ISRAEL DESTROYED AS A RESULT OF IT. TODAY IS A VERY IMPORTANT DAY IN PROPHECY.WHEN THE PALESTINIANS GO TO THE U.N FOR RECOGNITION OF THEIR STATE TODAY.THEY WILL BE ASKING FOR THEIR OWN STATE WITH JERUSALEM AS HALF OF THEIRS.ONCE THIS IS DONE,TODAY AND APPROVED.IT WILL BE SECURED IN HEAVEN OF THE ARAB/MUSLIMS DEMISE FOR DIVIDING JERUSALEM,ISRAELS ETERNAL CAPITAL AND JEWISH JESUS'S FUTURE RULING SITE.SO ONCE THE ARABS GET THIS WORLD RECOGNITION TODAY AFTER THE VOTE AS ITS ONLY 6:34AM NOW.THEIR DEMISE WILL BE FINALIZED IN HEAVEN.AND GOD WILL FULFILL HIS PROMISE OF DESTRYING ANYONE WHO TOUCHES ISRAEL OR JERUSALEM.FATHER GOD LET YOUR PROPHECIES BE FULFILLED TODAY IN HEAVEN AGAINST ISLAMS DESTRUCTION FOREVER FOR COMING AGAINST YOUR PEOPLE ISRAELIS AND YOU THE ONLY GOD OF ALL THE EARTH.IT IS DONE IN JESUS NAME AMEN AND AMEN. AFTER ALL THE DESTRUCTION AGAINST ISLAM IS FINALIZED I BELIEVE AT LEAST 350 MILLION MUSLIMS WILL BE DESTROYED.THE BIBLE SAYS 5/6TH WILL BE DESTROYED.SO IF THATS THE CASE 700 MILLION ISLAMICS WILL BE NUKED.I'M ONLY GOING BY 1/3RD OF ISLAM GETTING DESTROYED.IT IS DONE IN HEAVEN AS OF THIS DAY NOV 29,12.IF THE PALESTINIANS GET RECOGNITION IN THE U.N TODAY. AND I HEARD SOMEONE SAY 11 IN THE BIBLE IS JUDGEMENT.WELL NOVEMBER (11TH MONTH, 29 (11 COMBINED), 2012 (3 THE TRINITY IN THE BIBLE IS IN CONTROL OF TODAYS JUDGEMENT).IT ALL ADDS UP TO ISLAMS DESTRUCTION WHEN FINALIZED BY THE BIBLE. “We ask for a just peace, which is agreed on by the international community which will give us our state with east Jerusalem as its capital. Without that, there is no hope at all,” he said. If ten marks the perfection of Divine order, then the number eleven is an addition to it, subversive of and undoing that order. If twelve is the number which marks the perfection of Divine government, then 11 falls short of it. So that whether we regard it as being 10 + 1, or 12 - 1, it is the number which marks, disorder, disorganization, imperfection, and disintegration. The number SEVEN is one of the most significant numbers in the Holy Bible. This is a chapter from the book, Biblical Mathematics, written by Evangelist, Ed F. Vallowe. When man began to analyze and combine numbers, he developed other interesting symbols. He took the perfect world number FOUR and added to it the perfect divine number, THREE, and got SEVEN, the most sacred number to the Hebrews. It was earth crowned with heaven -- the four-square earth plus the divine COMPLETENESS OF GOD. So we have SEVEN expressing COMPLETENESS through union of earth with heaven. This number is used more than all other numbers in the Word of God, save the number ONE. In the Book of Revelation the number SEVEN is used throughout. There are SEVEN churches, SEVEN Spirits, SEVEN stars, SEVEN seals, SEVEN trumpets, SEVEN vials, SEVEN personages, SEVEN dooms, and SEVEN new things. SEVEN symbolizes Spiritual Perfection. All of life revolves around this number. SEVEN is used over 700 times in the Bible. It is used 54 times in the Book of Revelation.The whole Word of God is founded upon the number SEVEN. It stands for the SEVENTH day of the Creation Week, and speaks of the Millennial Rest day. It denotes COMPLETENESS or PERFECTION.In Leviticus 23:15-16, the number SEVEN and the Sabbath, which was the SEVENTH day, is connected with the word COMPLETE. The word COMPLETE follows after the words “SEVEN SABBATH” (Seventh day). The day following the SEVENTH sabbath there was something NEW that took place. “In the days of the voice of the SEVENTH angel, when he shall begin to sound the mystery of God should be FINISHED.”“It is DONE” is another expression found in connection with the number Seven.“And the SEVENTH angel poured out his vial into the air; and there came a great voice out of the temple of heaven, from the throne saying, It is DONE.” (Revelation 16:17)The word CREATED is used SEVEN times in connection with God’s creative work. (Genesis 1:1; Genesis 1:21; 1:27 (three times); 2:3; and 2:4). God created all things in the beginning and then took six days of restoring His creation and then rested on the SEVENTH day. (Genesis 2:1-3). He appointed SEVEN days for the week, and most, if not all advanced nations reckon time in that way: SEVEN days to the week. Few ever stop to think of why there are SEVEN days in a week. Do atheists and infidels give God and the Bible credit for it? There are SEVEN notes in the musical scale. All other pitches are only variations of these. When the musician uses the eighth note he goes back to “do” and starts over. Man named the notes but God fixed the sounds, even as God fixed the days of the week, and man named them.Noah took the clean beasts into the ark by SEVENS (Genesis 7:2) SEVEN days after Noah went into the ark the flood came. (Genesis 7:-10) Peter tells about the long-suffering of God waiting in the days of Noah. (I Peter 3:21) Those SEVEN days COMPLETED God’s time of waiting. Before Aaron and his sons entered their priestly work they were consecrated SEVEN days. (Leviticus 8:31-36) Here is a picture of a life COMPLETELY or WHOLLY consecrated or dedicated to the Lord for service.On the day of atonement the high priest sprinkled the blood upon the mercy seat SEVEN times. (Leviticus 16:14) This is a picture of the COMPLETENESS of the redemptive work of Christ.“By his own blood he entered in once into the holy place, having obtained eternal redemption for us." (Hebrews 9:12)When Christ offered Himself that FINISHED the sacrificial offerings. They were ended. No longer must we place sacrifices upon an altar. There were SEVEN branches on the CANDLESTICK in the Holy Place in the Tabernacle and this pictures the COMPLETE light of God for the souls of man.Solomon was SEVEN years in building the Temple and kept the Feast for SEVEN days. Job had SEVEN sons. When his friends came to visit him they sat SEVEN days and SEVEN nights in silence, and afterward they were required to offer a Burnt Offering of SEVEN bullocks and SEVEN rams. Naaaman washed SEVEN times in the Jordan. The Saviour spoke SEVEN words from the Cross. SEVEN men of honest report were chosen to administer the alms of the church in Acts 6:1-7. There were SEVEN years of plenty and SEVEN years of famine in Egypt during the days of Joseph.SEVEN times in the Book of Revelation blessing of the Lord are promised to His people. These are called the “BEATITUDES” of Revelation. These are found in Chapters 1:3; 14:13; 16:15; 19:9; 20:6; 22:7, 14.There are SEVEN Dispensations -- Innocence, Conscience, Government, Patriarchal, Law, Grace, and Milleniah (sic) Age.SEVEN times the Book of Life is mentioned in the Bible. The Book of Revelation is a Book of SEVENS. We have SEVEN churches, SEVEN seals, SEVEN Trumpets, SEVEN Personages, SEVEN vails (sic), SEVEN dooms, SEVEN new things. SEVEN SEVENS make up this Book . It is the COMPLETENESS of all things. In the second chapter of Daniel, Nebuchadnezzar had a dream of a great image whose head was of gold, arms and breasts of silver, his belly and things of brass, legs of iron, and feet of iron and clay. (Daniel 2:31-33) Daniel told him that he was the head of gold (vs 37-38) In the next chapter Nebuchadnezzar made an image of gold to be worshipped. At that time he called together SEVEN kinds of officials to the dedication of the image: (1) princes, (2) governors, (3) captains, (4) judges, (5) treasurers (6) counselors, (7) sheriffs. The penalty for refusing to worship that image was death by being cast into the burning fiery furnace. THREE Hebrew children refused to worship the image and were cast into that furnace of death, and brought forth alive, thus picturing the resurrection, signified by the number THREE That furnace was heated SEVEN times hotter than it had ever been. Here is a COMPLETE DELIVERANCE FOR GOD’S PEOPLE from the power of death. (Daniel 3:1-27) When those THREE Hebrew children came out of that furnace of fire, or death, there was not a trace of fire upon their bodies or their clothing. When Christ brings His people out of death there will not be a trace of death left on them. The will be COMPLETELY delivered from its power. UNITED NATIONS — The U.N. General Assembly will decide Thursday whether to upgrade the status of the Palestinian Authority at the world body from an entity to a non-member state. The Palestinians chose this day for the vote because it is the International Day of Solidarity with the Palestinian People.About 60 countries are co-sponsoring the resolution that will be introduced Thursday afternoon. Palestinian Authority President Mahmoud Abbas will address the General Assembly just ahead of the vote.The Palestinians are expected to obtain the required simple majority of the U.N.’s 193 member states who are present and voting. But they will not have the support of some key countries, including the United States and some Europeans.The United States firmly opposes the move, saying the only road to statehood for the Palestinians is through direct negotiations with Israel.U.S. State Department spokesperson Victoria Nuland said Deputy Secretary of State William Burns and Special Envoy for Middle East Peace David Hale met Wednesday with President Abbas in New York to repeat Washington’s concerns and urged him to reconsider.“The deputy secretary also reiterated that no one should be under any illusion that this resolution is going to produce the results that the Palestinians claim to seek, namely to have their own state living in peace next to Israel,” she said.Israel also opposes the initiative in the General Assembly, which will open doors for the Palestinians, including membership in U.N. organizations and the possibility of joining the International Criminal Court.If the Palestinians are allowed to join the court, they could ask the prosecutor to investigate Israel’s actions in their territories. Palestinian U.N. Ambassador Riyad Mansour said this week that they are unlikely to apply to join the court anytime soon.“I don’t believe that we are going to be rushing the second day to join everything related to the United Nations, including to the ICC. But yet at the same time, it is not fair for us to tie our own hands of all the possibilities that could be available to us,” he said.The ambassador dismissed critics who warn the Palestinian move is a unilateral one that will hurt the peace process. He said that if the day after the resolution is adopted Israel wants to negotiate in good faith with the Palestinian Authority, the Palestinians would respond "in a positive way." UNITED NATIONS (Reuters) - The U.N. General Assembly is set to implicitly recognize a sovereign state of Palestine on Thursday despite threats by the United States and Israel to punish the Palestinian Authority by withholding much-needed funds for the West Bank government.A resolution that would change the Palestinian Authority's U.N. observer status from "entity" to "non-member state," like the Vatican, is expected to pass easily in the 193-nation General Assembly.Israel, the United States and a handful of other members are planning to vote against what they see as a largely symbolic and counterproductive move by the Palestinians, which takes place on the 65th anniversary of the assembly's adoption of resolution 181 on the partition of Palestine into Jewish and Arab states.Palestinian President Mahmoud Abbas has been leading the campaign to win support for the resolution, and over a dozen European governments have offered him their support after an eight-day conflict this month between Israel and Islamists in the Gaza Strip, who are pledged to Israel's destruction and oppose his efforts toward a negotiated peace.The U.S. State Department said on Wednesday that Deputy Secretary of State Bill Burns and U.S. Middle East peace envoy David Hale traveled to New York on Wednesday in a last-ditch effort to get Abbas to reconsider.The Palestinians gave no sign they were turning back.Secretary of State Hillary Clinton repeated to reporters in Washington on Wednesday the U.S. view that the Palestinian move was misguided and efforts should focus instead on reviving the stalled Middle East peace process. "The path to a two-state solution that fulfills the aspirations of the Palestinian people is through Jerusalem and Ramallah, not New York," she said. "The only way to get a lasting solution is to commence direct negotiations. "State Department spokeswoman Victoria Nuland reiterated U.S. warnings that the move could cause a reduction of U.S. economic support for the Palestinians. The Israelis have also warned they might take significant deductions out of monthly transfers of duties that Israel collects on the Palestinians' behalf.Despite its fierce opposition, Israel seems concerned not to find itself diplomatically isolated. It has recently toned down threats of retaliation in the face of wide international support for the initiative, notably among its European allies. "The decision at the United Nations will change nothing on the ground," Israeli Prime Minister Benjamin Netanyahu said in Jerusalem. "It will not advance the establishment of a Palestinian state. It will delay it further." Granting Palestinians the title of "non-member observer state" falls short of full U.N. membership - something the Palestinians failed to achieve last year. But it would allow them access to the International Criminal Court and some other international bodies, should they choose to join them.Hanan Ashrawi, a top Palestinian Liberation Organization official, told a news conference in Ramallah that "the Palestinians can't be blackmailed all the time with money. ""If Israel wants to destabilize the whole region, it can," she said. "We are talking to the Arab world about their support, if Israel responds with financial measures, and the EU has indicated they will not stop their support to us. "Peace talks have been stalled for two years, mainly over the issue of Israeli settlements in the West Bank, which have expanded despite being deemed illegal by most of the world.In the draft resolution, the Palestinians have pledged to relaunch the peace process immediately following the U.N. vote.As there is little doubt about how the United States will vote when the Palestinian resolution to upgrade its U.N. status is put to a vote sometime after 3 p.m. (2000 GMT) on Thursday, the Palestinian Authority has been concentrating its efforts on lobbying wealthy European states, diplomats say. It's no accident that the Palestinian Authority is bringing its “case” to the United Nations on November 29 – a day that has for 65 years been identified with the State of Israel.“It's very typical of the PA to choose the day that Israel was recognized as a state by the UN as the date for their state's recognition,” said one historian. “The PA has tried to co-opt so many Jewish and Israeli symbols in the past, and the co-opting of November 29 fits right in with that,” said Moshe Siebel, a history afficianado.The 29th of November is perhaps the only date on the secular calendar to be adopted into the Hebrew calendar, feted as “Kaf-Tet b'November..” Streets in many cities in Israel bear the name, and in the past it has been celebrated as a semi-holiday by Israelis as the day that the United Nations officially partitioned Palestine in 1947, and declared that a portion of the soon-to-be-defunct British Mandate for Palestine be reserved for a Jewish state.Now, in 2012, the PA is set to get UN General Assembly recognition for a state on land it already controls, but cannot have an army on at present. In a vote later Thursday, the UN is expected to recognize 'Palestine' as a non-voting, non-member observer state.UN Resolution 181 was the first official recognition of the national rights of the Jewish people in the Land of Israel in the modern age, going farther than the 1917 Balfour Declaration, which recognized Mandatory Palestine as a “national home” for the Jewish people. Although the Partition Plan caused much dispute among Zionists, as it reserved only a small part of western Mandatory Palestine as the future Jewish state and did not include Jerusalem, which was to be internationalized, the Jewish community and its institutions embraced it. Thousands of people in Tel Aviv, Jerusalem, Petach Tikvah, and other centers of Jewish settlement celebrated in the streets.The Arab countries categorically rejected the Partition Plan, and vowed to crush the incipient Jewish state – a vow they tried to follow through on barely seven months later, in May 1948, after David Ben-Gurion declared the State of Israel. Armies from seven Arab countries immediately opened a war of annihilation against the Jewish community, but were miraculously beaten back, with the new State capturing important land areas that, had the Arabs agreed to the Partition Plan, would have been a part of an Arab state.For Jews around the world, November 29, 1947, was a very emotional day – in a sense, the rebirth of the Jewish people after the horrors of the Holocaust.Mandatory Palestine was already the home of hundreds of thousands of refugees who had managed to escape Europe, and hundreds of thousands more, still living in Europe and in refugee camps in Cyprus, were poised to immigrate to Israel as soon as Britain's Mandate had expired. BRUSSELS - The EU commission Wednesday published its vision for a "genuine" economic and monetary union (EMU) under which national budgets could be vetoed and a central European budget would allow transfers for troubled countries.The process would require two rounds of treaty change – one within the next five years and another more profound exercise in the longer-term.The 52-page blueprints emphasises the need for the eurozone to be able to "integrate quicker and deeper" than the rest of the EU, with the eurozone now largely seen as paying for being established as a political project without the fundamental economic and financial structures to back it up.Ideas for the future include coordinating national tax and employment policies, eurobonds, and a eurozone budget managed by a treasury in the European Commission. European Commission President Jose Manuel Barroso said the "main message" of the document is that both discipline and solidarity are needed for the EMU to survive.The paper envisages progress in three steps. Within the next 18 months, the EU should set up a banking union and establish a "convergence and competitiveness instrument" - money that member states would use to undertake structural reforms. Countries with a budget deficit breaking EU rules would be obliged to use the instrument.Within five years, the "convergence instrument" would be built up into a separate eurozone budget that would be funded by own taxes in the eurozone.This time frame would also see "further budgetary coordination (including the possibility to require amendments to national budgets or to veto them)," says the paper.There should be short-term eurobonds - the pooling of euro states' debt - and a redemption fund for states with large public debt. These steps would need a treaty change.Other steps to consider would be giving "clear competence for the EU level to harmonise national budgetary laws and to have recourse to the Court of Justice in case of non-compliance. "Final steps to full economic and monetary union would only be taken in the "longer term" and would require "major treaty reform" suggests the paper.This would likely include a possibly large central budget with stabilisers – meaning money would be transferred to member states in trouble.“As a final destination it would involve a political union with a central budget as its own fiscal capacity and a means of imposing budgetary and economic decisions on its members.”Noting the “degree” of sovereignty member states would have to hand to Brussels, the paper suggests that the European Parliament “primarily” needs to ensure the democratic nature of the process.The blueprint underlines that intergovernmentalism – where governments alone take decisions – would undermine the “accountability” of the set-up.The paper is to feed into a report on the future of economic and monetary union to be discussed by EU leaders next month. Many of the ideas proposed have already cropped in other commission papers but the main stumbling block remains unchanged – the political will of member states. NEW YORK — The convulsions of the Arab Spring may be driving the American public’s support for Israel to new highs, according to a poll released Wednesday by the Washington-based group The Israel Project.Americans who say the United States should support the Jewish state in the conflict with the Palestinians increased from 60 percent a year ago to 68% today, a survey of voters taken November 6-8 by Greenberg Quinlan Rosner has found.Those who said they supported the Palestinians dropped from 8% to 7% in that time.The survey polled 793 respondents and the margin of error is 3.5%.“Given the turmoil in the Middle East, increased support among the American public for deepening the special relationship between the US and Israel is both a natural reaction and good policy,” said Israel Project CEO Josh Block. “Americans know that Israel is our greatest and only truly reliable ally in the region, and that is more true today than ever,” he added.That analysis is supported by the finding that 81% of Americans want to maintain or bolster US relations with Israel, while only 13% want the US to distance itself from Israel. (A consistent 2% want the US to “end its relationship with Israel.”)That’s a significant bump in support for the relationship from one year earlier, when support for maintaining or strengthening the relationship was at 73%, and for distancing at 23%.Similarly, 59% said the US should work more closely with Israel, compared to just 24% who said it should work more closely with traditional Arab allies, like Saudi Arabia and Egypt.The poll measured the “warm” feelings of respondents toward each side in the Israeli-Palestinian conflict. Feelings for Israel, it found, remained identical compared to a year ago, with 60% saying they had “warm” feelings while those saying they had similar feelings for Palestinians dropped precipitously, from 26% a year ago to 16% today.While a huge majority supports a two-state solution (69% support, 16% oppose), a large majority (57% to 27%) opposes unilateral Palestinian moves at the United Nations.The increase in support for Israel over the past year is particularly striking in that it has not been accompanied by increased support for the Palestinians as well. According to figures released by The Israel Project, polls over the past seven years have seen simultaneous increases and declines of support for the two sides. Usually, during flare-ups in the conflict, both sides see increased support as those in the middle choose sides.During the past year, however, the increase in support for Israel was not accompanied by an increase in support for the Palestinians, suggesting that in the wake of the Arab Spring the middle ground is tilting toward the Jewish state alone. Americans are also skeptical about the new Muslim Brotherhood government in Egypt. Fifty-five percent of respondents agreed with the statement that new governments “in Middle Eastern countries like Egypt threaten US security interests because they are run by religious extremists.”At the same time, just 30% agreed with the statement that the new governments “do not threaten US security interests, because they are likely to be moderate and become more pro-Western.”The Israel Project also released polling data from Egypt on Wednesday that hinted at the effect an Iranian nuclear weapon might have in the region. According to a TIP/Greenberg Quinlan Rosner survey of Egypt conducted in August 2012, 87% of Egyptians said they want a nuclear weapons program for their country, while 65% approve of resuming diplomatic relations with Iran. Fully 62% said they believed Iran “and its president Mahmoud Ahmadinejad” are “friends of Egypt.”In the November poll of Americans, 76% of respondents said the Israel-Egypt peace treaty was a “vital” US interest, and a majority (59% to 31%) favored withholding American aid to Egypt if Cairo attempts to abrogate its peace treaty with Israel. In November 2011, 61% supported, while 33% opposed. In November 2012, the figures were 71% supporting and just 22% opposed. Former prime minister Ehud Olmert has come out in favor of the Palestinian Authority’s bid for nonmember state status at the UN, bucking Jerusalem’s steadfast opposition to the move.In a letter to Israeli-American writer Bernard Avishai published in The Daily Beast early Thursday, Olmert says the Palestinians’ request runs in line with the two-state solution concept and will help move talks along.“The Palestinian request from the United Nations is congruent with the basic concept of the two-state solution. Therefore, I see no reason to oppose it,” he wrote.Ramallah has vowed to go ahead with the resolution on Thursday, despite heavy pressure from the US and Israel to drop the gambit.The vote is expected to lean heavily in favor of the Palestinians, and may give them access to world bodies such as the International Monitary fund and the International Criminal Court. A bid for full member status last year was scuttled by the Security Council. Israel argues that Palestinian Authority President Mahmoud Abbas is trying to dictate the outcome of border talks by going to the UN, and fears the PA will try to leverage its access to the ICC to force Israel’s hand. Olmert, however, echoed the Palestinian position that having the UN weigh in will help move talks forward. “Once the United Nations will lay the foundation for this idea, we in Israel will have to engage in a serious process of negotiations, in order to agree on specific borders based on the 1967 lines, and resolve the other issues,” he wrote. “It is time to give a hand to, and encourage, the moderate forces amongst the Palestinians. [Abbas and Palestinian Prime Minister] Salam Fayyad need our help. It’s time to give it.”According to Avishai, many other leaders and military officials are also in favor of the bid, if only to strengthen the moderate Abbas, who took a hit in popularity during Israel’s eight day mini-war with Hamas earlier this month.Olmert, a former hard-line Likud member and mayor of Jerusalem, made headlines earlier this year when he called for Israel to divide Jerusalem, an issue more taboo in Israeli society than Palestinian statehood.A dovish prime minister under the centrist Kadima party from 2005 to 2009, Olmert reportedly came close to reaching a deal with Abbas before talks got cut off by Israel’s 2008 invasion of Gaza. Olmert was forced to leave office soon after in the wake of corruption charges, most of which he was eventually cleared of, and high-level talks have not resumed under Prime Minister Benjamin Netanyahu. Though Olmert is still embroiled in a real estate corruption case, he is reportedly weighing returning to politics when Israelis go to the polls in January. The Palestinians say they need UN recognition of a Palestinian state in the West Bank, Gaza and east Jerusalem, the lands Israel captured in 1967, to be able to resume negotiations with Israel.Israel argues that Abbas is trying to dictate the outcome of border talks by going to the UN, though the recognition request presented to the world body calls for a quick resumption of negotiations on all core issues of the conflict, including borders.It’s not clear if negotiations could resume even if Obama, freed from the constraints of his re-election campaign, can turn his attention to the Mideast conflict.Abbas aides have given conflicting accounts of whether Abbas, once armed with global backing for the 1967 borders, will return to negotiations without an Israeli settlement freeze.Israel has said it is willing to resume talks without preconditions. 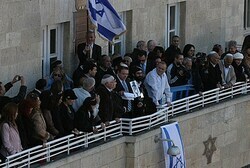 Government spokesman Mark Regev affirmed the position on Wednesday. Regev said that by going to the UN, the Palestinians violate “both the spirit and the word of signed agreements to solve issues through negotiations.”Palestinian officials countered that their historic UN bid is meant to salvage a peace deal they say is being sabotaged by Israeli settlement expansion. “It is a last-ditch effort because we believe the two-state solution is in jeopardy as a result of these actions,” Ashrawi said.German Chancellor Angela Merkel said Wednesday that “in the long term, this region can only find peace through negotiations to resolve the Middle East conflict,” but she did not say whether her country would abstain or vote against.“Nothing will really be gained either by unilateral Palestinian initiatives at the United Nations which aim for recognition nor by Israel’s continued building of settlements,” she said.Other than creating leverage in negotiations, UN recognition would also allow the Palestinians to seek membership in UN agencies and international bodies, for example making them eligible for loans from the International Monetary Fund.Perhaps most significantly, it could open the door to a new attempt to join the International Criminal Court and seek an investigation into alleged war crimes by Israel in the territories.Abbas’ self-rule government, the Palestinian Authority, unilaterally recognized the court’s jurisdiction in 2009 and pressed prosecutors to open an investigation into Israel’s previous Gaza offensive. Prosecutors noted at the time that the court’s founding treaty, the Rome Statute, is only open to states. Israel has not signed the statute and does not recognize the court’s jurisdiction.Ashrawi on Wednesday avoided explicit threats to take Israel to court, but suggested it’s an option. “If Israel refrains from settlement activities … there is no immediate pressing need to go,” she said, adding that this could change if “Israel persists in its violations.”On Tuesday, a Palestinian official said the PA may try to take Israel to the ICC if a probe into the death of Palestinian leader Yasser Arafat finds he was poisoned.Israel would respond “forcefully” if the Palestinians try to pursue war crimes charges against Israel at the ICC, said an Israeli government official who spoke on condition of anonymity to discuss policy considerations. If the Palestinians use their upgraded international status “as a tool to confront Israel in the international arena, there will be a response,” he said.Until then, he said, Israel will be bound by its obligations to the Palestinians under existing peace agreements, but won’t necessarily go beyond them. In the West Bank, the view of Abbas’ quest for recognition was mixed. Many were bitter, saying they’ve heard too many promises that statehood is near and don’t believe a nod from the UN will make a difference. “Nothing will come of it,” said Arwa Abu Helo, a 23-year-old student in Ramallah. “It’s just a way of misleading the public.”Yousef Mohammed, a bank teller, said Abbas was trying to “gain the spotlight after Hamas said it won in Gaza.”Hurriyeh Abdel Karim, 65, said she was willing to give Abbas a chance. “If he succeeds, maybe our life improves,” she said. Israelis and Palestinians need to begin speaking about what they have in common if they want peace in the region to have a chance, Egyptian President Mohammed Morsi said in an interview published by Time magazine late Wednesday.Speaking to the weekly from Cairo days after helping broker a ceasefire that ended eight day of fighting between Israel and Gaza, the country’s embattled president appealed for an end to bloodshed all around the Middle East and North Africa and said he and US President Barack Obama were working toward that goal.“President Obama has been very helpful, very helpful. And I can say really that his deeds coincide with his intentions,” he said, speaking in English. “We’ve been talking together about the cease-fire, that’s very important, then we can talk about differences between Palestinians and Israelis. It’s not easy. It’s very difficult. Both sides are talking about differences. We want them to talk about similarities…. We are now doing this job as much as we can.”Morsi, under fire at home for pushing through a serious of unpopular measures that essentially place him above judicial oversight, dismissed claims that he was a “pharoah” and said the country’s ills were a product of its lack of constitution.“I’m sure Egyptians will pass through this. We’re learning. We’re learning how to be free,” he said. “We haven’t seen this before. We’re learning how to debate. How to differ. How to be majority and minority. … We don’t have a parliament now. That’s too bad. We don’t have a constitution now. That [situation is] urging us, pushing people, to finish this but in some sort of stable climate and situation so people can go and vote on the constitution. We want to finish it.”An activist for the Islamist Muslim Brotherhood before rising to power, Morsi said the group would protect freedom of religion in Egypt and not seek to clamp down on non-Muslims.“We cannot get stable unless we have freedom, democracy, rights for everyone, equal rights, equal rights for men and women, for Muslim, Christians, for whoever is carrying any opinion,” he said. He also said he would work to protect democracy in the country.Despite his words, Morsi is facing serious challenges at home from protesters and judicial figures, as anger over his recent decrees crests.Judges in the country’s top courts went on strike Wednesday to protest Morsi’s seizure of near absolute powers, while Islamists rushed to complete a new constitution, the issue at the heart of the dispute.The moves came a day after at least 200,000 protesters filled Cairo’s central Tahrir Square to denounce the decrees Morsi issued last week, which place him above oversight of any kind, including by the courts.Threatening to turn the dispute into violent street clashes, the Muslim Brotherhood and the more radical Islamist Salafi Al-Nour party, called for a counter-demonstration this weekend in Tahrir Square, where Morsi’s opponents have been holding a sit-in for over a week.Morsi has said the decrees are necessary to protect the “revolution” that helped drive Hosni Mubarak from office last year as well as the nation’s transition to democratic rule. The constitutional declaration also provides the 100-member panel drafting a new constitution with immunity from the courts.In a sign the dispute may take a sharp turn, the Supreme Constitutional Court said in a statement that it will go ahead with plans to rule Sunday on whether to dissolve the assembly writing the new constitution, which is dominated by the Brotherhood and its Islamist allies. A letter to the famous leftist Israeli man of letters, who has asked Israel to strike a deal with Hamas. A. B. Yehoshua is a great author and a long standing friend of mine. Despite an old, very interesting book of his about Zionism, Bouli, as everyone calls him, is truly a Zionist, who only sees in politics what his highly talented artistic dreams point out for him; fiction rather than reality is his specialty.So when yesterday, he asked Israel to strike a deal with Hamas on La Stampa, he repeated the same mistakes he’s made a thousand times in the conviction that in order to make peace with the Arabs just ask them, say please and give them a good gift - that would suffice. For some strange reason the whole ideology factor totally eludes him, which in the case of Hamas is certainly of paramount importance. It’s not that Bibi Netanyahu, as Yeoshua likes to say, gave Hamas the title of “terror organization” rather than “foe”, shunning in this way any possible agreements: no, Hamas is a terrorist group as per the International declaration.,The European Union put Hamas on its list, as did the US too, not just Israel. Hamas, unlike Jordan and Egypt, is neither a state nor a statutory enemy; its goal, as enshrined by its Charter to which it is faithful (please, take a look at it, it’s a fascinating read into the horror), is to destroy Israel and kill all Jews, A. B. Yehoshua included.Jordan, like Syria and Egypt, doesn’t have this aim as a principle in its constitution. Their behavior in the course of the different wars has certainly been cruel and unforgivable: but none of the adjacent states has as its main purpose to destroy Israel and kill all Jews one by one, all over the world.It is therefore possible -maybe - to make peace with them. Hamas on the contrary, does not exist but for the sole purposes of waging war on the West in order to institute Shariah law, ando teaching children to become shahid. The recognition sought by Hamas is a leadership medal in Shariah, its main aspiration being that Heads of States who visit proclaim to the whole world Hamss' right to be the best butcher of Israel, not its partner. Bouli’s request will become a medal that Hamas will pin upon its chest so as to state: you see, how frightened the Israelis are of our desire to tear them to pieces? A.B. Yeoshua asked for an agreement.In the Middle Eastern mind-set this is a serious blunder, if you are afraid you’re dead, if you ask for peace while the other is declaring eternal war you are less than a coward trying to escape. It would be good to bargain with the Palestinian Arabs about a “reasonable partition”, but what was possible for King Hussein or Sadat doesn’t work with Ismail Haniye or Khaled Mashaal.Hamas has got nothing to gain in asking for a “reasonable partition”, it is not interested in two states for two peoples. There would be three anyway, considering that Hamas, as everyone will surely remember, hates the PLO. It does not wish to unite with Abbas, but to swallow him into one single ferocious Hamasland. Hamas is not barricaded in a strip of land; the crossings are open for humanitarian aid and for power, water, medications, and the Internet flow from Israel.It might be expected that all of this burden be taken on by Egypt, which should unlock its doors, as it’s the natural outlet, vast and promising for an Arab population. Egypt, for sure, is not Israel, the country where they are known for infiltrating, bringing, as they’ve always done, suicide terrorism and hostile smuggling.Yehoshua can’t expect that an opening with Gaza can be fruitful for peace, he knows what fruits it would bear, as he also knows that Abbas wouldn’t be happy with it. He doesn’t want to see Hamas intrude to his home. Bouli knows that it was not the elections which conferred Hamas absolute power in Gaza, but the war between the two parties. Someone might still remember that Al Fatah henchmen were thrown off the roofs in Gaza by their fellow Arabs. Historically, all Palestinian Arabs strongly dismiss the idea of considering Israel a neighbor; instead, they see it as a foreign body to the point that even PLO, led by Arafat in the past, currently by Abbas, aborted one by one all of the attempted agreements in the past years.The Palestinian Authority doesn’t seek to strike a deal, which, as Bouli overtly puts it, can’t sign without Hamas: on the contrary, it praises terror and war and it’s forwarding the bid for a unilateral statehood to the UN on Thursday, without negotiations, without sitting down with the Jews, with Bouli himself.PA folks are not seeking an agreement; it would cost them the dishonor of the entire Islamist religious world, not to mention Hamas. A new Middle East is surely rising on the horizon, you are correct Bouli, but in the aftermath of the Arab Revolutions the Muslim Brotherhood, which Hamas belongs to, is pursuing a worldwide caliphate: Israel will be its first, tastiest bite. Dow +40 points at 4 minutes of trading today. Dow -8 points at low today. Dow +60 points at high today so far. GOLD opens at $1,723.50.OIL opens at $88.43 today. Dow -8 points at low today so far. Dow +60 points at high today.